Origin and Habitat: Agave parryi ssp. neomexicana occurs in Texas (El Paso Co., Franklin Mts., S of South Mt. Culberson Co., Guadalupe Mts.) just south of the New Mexico border and in southeastern New Mexico (and coahuila Maexico?). Altitude range: 500-2350 metres above sea level. Habitat and ecology: It grows sympatrically together the a similar, but autumn flowering Agave gracilipes in rocky limestone slopes and grasslands. Description: Agave parryi ssp. neomexicana (New Mexico Century plant) is a small, but very cold hardy plant, about 30-45 cm tall and 40-60 cm across, with light glaucous grey to light green leaves in a symmetrical rosette. Agave neomexicana resembles Agave parryi but with narrower triangular shaped uniformly blue-green to powder blue leaves edged with dark burgundy spines, that in some forms are very striking. It can remain somewhat solitary but often suckers to form small colonies. Like all agaves, A. neomexicana only flowers once, after which the original plant dies; but since it suckers freely, new plants will replace it. The inflorescence can be quite colorful with red or orange-red flower buds and open flowers of a brilliant golden yellow. Plants of Agave parryi ssp. neomexicana are about the same size as those of Agave parryi var. couesii, and the two might be difficult to tell apart. Rosettes: Freely suckering, few to many-leaved, rather flat-topped. Leaves: Uniformly light glaucous grey to grey-green, 20-45 cm long, 5-12 cm wide, lanceolate, usually broadest near middle, rigid, thickly rounded below, concave above armed above mid-blade with brown to grey straight marginal spines mostly 5-7 mm long, 1-3 cm apart, nearly straight or retrorsely barbed, each barb arching backward, slender, dark brown to greyish and a stout 2.5-5.5 cm long reddish brown. There are smaller teeth on the lovver part of the leaves. Terminal spine subulate to acicular, flat above in a broad shallow groove, decurrent for 1 to several teeth. Inflorescences: Paniculate on a 3-4 m tall candelabra type stalk with rather distant scarious reflexed triangular bracts, with mostly 10-17 compact umbellate branches in upper half of stalk. Blooming season: Flowering for this species occurs in late spring and early summer. The plant takes 15 years to mature and bloom, then it dies. 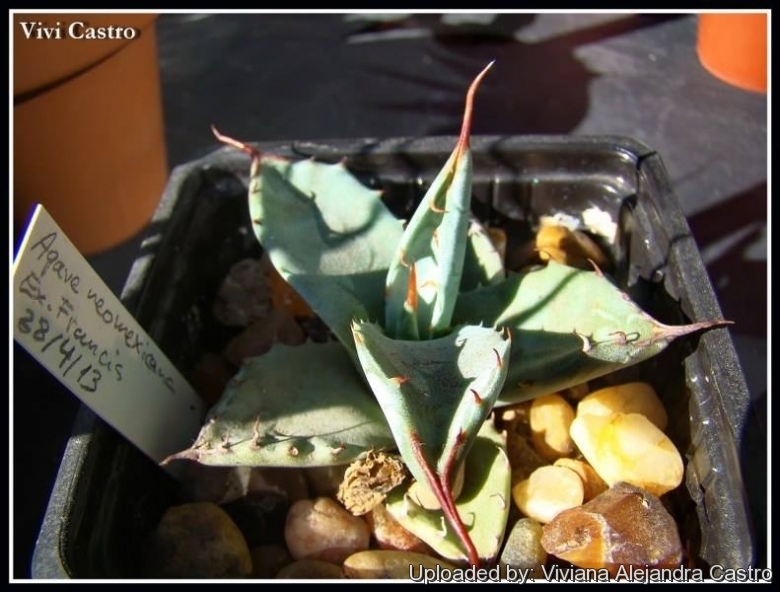 1) San Marcos Growers contributors “Agave neomexicana - Mescal/ New Mexico Agave” San Marcos Growers <http://www.smgrowers.com>. Web. 27 Sep. 2014. Cultivation and Propagation: Agave parryi ssp. neomexicana is usually cultivated outdoors in rock gardens, in cactus and succulent gardens, as it is very cold hardy, withstanding temperatures as low as -28° degree Celsius. It suckers, but tends to be slow to sucker, so easy to keep control of. Because of its compact size, plus its low water use and low maintenance, it is considered a good landscaping plant for desert residential landscaping. Hardiness: Agave parryi is one of the most cold hardy of the agaves, (hardy to -18 to -28°C depending by clones (USDA zones: 5-11). Traditional uses: This plant was called Mescal in association with the Mescalero tribe of the Native American Apache who roasted and ate the plant.